Like several other road apples, the Power Mac4400 (known as the 7220 in some markets) wasn't a terrible design, just an odd one. Just look at the picture - it had the floppy drive on the left, which is a very un-Mac-like place to put it. 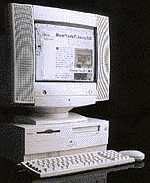 But then there was a lot about the Spartan, utilitarian Power Mac 4400 that was un-Mac-like. It used the same kind of motherboard as the Motorola StarMax 3000, one with a fixed CPU. This machine was not intended for upgrades. Despite the fact that Apple had a wonderful case for the Power Mac 7200 through 7600, it went with what is essentially a PC clone case, complete with hard metal edges. The 4400 had all the usual ports, three PCI slots,* and very little to set it apart from the less expensive clones from Power Computing, Motorola, and Umax. Of course, those were the models AppleDesigned the 4400 to compete against. No wonder MacWeek called it "a strange bird." * Apple pulled one PCI slot in the 200 MHz version, replacing it with a Comm II slot.